If there's one thing that never seems to change, it's that anti-vaccine types just do not understand science. They love to pick and choose from the literature when they think they find something that supports their "vaccines are the root of all evil in the world" ideology, but more often than not, the source actually does not support their viewpoint. Some think, for example, that recent measles outbreaks have occurred predominantly among the vaccinated, when nothing could be further from the truth. To support their position, they cite studies where the majority of cases were unvaccinated, or where none of the cases were vaccinated (and the index case was a patient of an anti-vaccine doctor), or a report of a 30-year-old outbreak occurring under very different conditions than today. More often than not, they latch onto a phrase or a few sentences from a study that they think supports their position without taking into consideration the rest of the study. Some simply copy and paste from other anti-vaccine sites without even reading anything for themselves. The end result is that they make a fool of themselves. The latest example of this come courtesy of the Vermont Coalition for Vaccine Choice (VCVC), a horribly misnamed offshoot of the even more horribly misnamed National Vaccine Information Center. Though asserting themselves as "pro-safe vaccine", their actions and words reveal them to be fervently opposed to any and all vaccines. I first wrangled with VCVC in the comments on a Vermont news article. Since then, they have accused me of being paid by "Big Pharma", have tried to find out who I am and "out" me (though why I can only speculate) and have contributed to the spread of misinformation about vaccines that has led to the largest outbreak of measles in decades. We may indeed see a comeback of measles due to waning immunity of these liability-free vaccines. In 2009, the analysis of one of the only realistic immunological models for measles infection and vaccination was published (http://rspb.royalsocietypublishing.org/content/276/1664/2071.full) and is well worth a read. 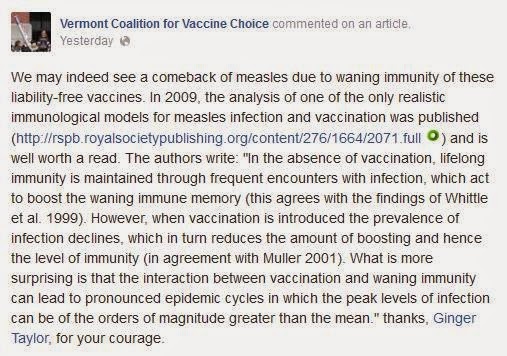 The study she links to is "Implications of vaccination and waning immunity" by J.M. Heffernan and K.M. Keeling, published in the Proceedings of the Royal Society in June 2009 (online March 2009). The first thing I'd say is that we are already seeing measles coming back due to people not vaccinating, and they are not vaccinating thanks to the tripe spewed by groups like VCVC (again, thanks, anti-vaxxers!). Second, she repeats the canard that vaccines are liability-free. They aren't. Finally, I actually will agree that the study is well worth the read, though perhaps not for the reasons that she thinks, since she cherry picks her quote to misrepresent the study in her attempt to villify vaccines. In the absence of vaccination, lifelong immunity is maintained through frequent encounters with infection, which act to boost the waning immune memory (this agrees with the findings of Whittle et al. 1999). However, when vaccination is introduced the prevalence of infection declines, which in turn reduces the amount of boosting and hence the level of immunity (in agreement with Muller 2001). What is more surprising is that the interaction between vaccination and waning immunity can lead to pronounced epidemic cycles in which the peak levels of infection can be of the orders of magnitude greater than the mean. Let's step back a bit. The authors of the study set out to model both how the measles virus behaves within an individual host and how it behaves in a population. One limitation they cite of other epidemiological models is that they tend to view people as 100% susceptible or 100% immune, when the reality is that it's more of a sliding scale, depending on the individual's immune response, exposure to the virus, and so on. Their model attempts to address this. Another assumption that the authors make is that immunity wanes with time. They suggest that the lifelong immunity we see after natural infection is really due to the fact that as measles continues to circulate, those who have immunity from infection are re-exposed, and that that exposure acts to boost the immune system, ensuring that those individuals remain immune to infection. Vaccination would have the effect that this re-exposure does not occur, once uptake reaches a certain level for a long enough period of time. Endemic measles is eliminated, so there are few opportunities for individuals to come into contact. If the immunity from the vaccine wanes, then we would see particularly large outbreaks occur among a highly vaccinated population. If the authors' model is accurate, then their findings have implications for vaccination policy, namely that we may need to consider booster doses of measles vaccine to prevent such outbreaks from occurring. There are several limitations to the model that must be considered, as well. They do not appear to have considered the effects of booster doses on the population-level behavior of the virus. They also note that their model does not include the humoral immune system, age differences, or seasonal effects. Each of these could have an impact on how their model holds up in the real world. But there are also some other implications to their work that the Vermont Coalition for Vaccine Choice does not seem to have considered. The first is this: anti-vaccine types such as VCVC claim that measles infection gives lifelong immunity, implying that once you have had it once, that's it. Your immunity never wanes, they say, the way that vaccine-induced immunity does. This model, however, shows that that lifelong immunity could be just an illusion. 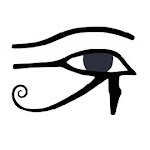 Without subsequent exposure to the virus, that immunity wanes and will, given enough time, disappear, leaving one susceptible to infection again. Though rare, measles has been known to re-infect people who had previously recovered from the disease. Even as early as the 1830s, doctors began to give credence to this idea, which most had thought impossible, given the decades-long duration of immunity. It can also cause asymptomatic infection in those with "natural" immunity as their immunity wanes over time. It bears emphasizing, though, that we are talking immunity that typically takes decades to wane. Similarly, vaccine-induced immunity also wanes with time, according to this model, and at a slightly faster rate than natural infection, yet that, too, is in the order of decades. So we see that, contrary to anti-vaccine claims, immunity, whether from natural infection or from vaccination, can wane over time, leaving people more or less susceptible to disease. Granted, given the duration of immunity, we can, I suppose, use shorthand to describe it as "lifelong". Another question to consider is this: anti-vaccine activists like to go on about shedding from live virus vaccines, and how that shedding can cause disease in contacts. This, they argue, is a more likely cause of outbreaks than the fact that they refuse to be vaccinated. "It's the vaccinated that are spreading disease, not us!" So goes their mantra as they try to deflect blame and criticism. Okay. Let us suppose that is the case. Then if the Heffernan/Keeling model is correct, then this shedding should actually be a good thing, in that it would be expected to boost the immune memory of those who are already immune to measles. The authors did not examine that particular aspect, particularly since it is not well established that the virus shed following measles vaccination is capable of eliciting a robust enough immune response. It also was not clear from the paper whether the authors examined the question of exposure to the wild virus boosting immunity among the vaccinated. Finally, the authors do not make a case for ceasing vaccination, much as the Vermont Coalition for Vaccine (misinformed) Choice wish it. What they do show is that we must consider the long-term effects of the vaccination program. Currently, we do not give measles boosters to adults. There currently is no evidence that vaccine immunity wanes sufficiently to leave whole populations susceptible to the virus, so there has not appeared to be a need for boosters. All the evidence we currently have suggests that, like wild infection itself, vaccine immunity is lifelong, or close enough that it is not a major concern for public health. However, if the model developed by Heffernan and Keeling accurately predicts a likely real world scenario, then public health officials ought to consider adult measles boosters. We need others to examine this model to see how well it bears out in real life. Given that this paper is from 2009, there may have been more work on this area, but I have not had time to look, yet. Mathematical models can be very informative, but how well they reflect reality is always a question. They can inform how we investigate disease transmission and outbreaks and how we plan to respond to different emergency scenarios. But they must necessarily be taken with a grain of salt. They make simplifications and assumptions that may not be correct. Nature, and the immune system in particular, is incredibly complex. We can approximate what is likely to occur in a model, but there will always be room for a curve ball. So while this paper is certainly interesting and well worth the read, especially among immunologists and epidemiologists, it does not say what the Vermont Coalition for Vaccine Choice thinks it says. Once again, in their eagerness to villify vaccines, they cherry pick quotes, but get the science wrong. Shared next to relevant comment. Thank you. I'll go ahead and speculate. They find you intimidating and want to "out" you so they can harass your employer, your families' employers and discredit you in any way they can to remove you from their path. I read it in their playbook. You kind of touched upon this next one but I'll go ahead and expound upon it. It is so very odd and warped logic for them to reject the mountain of scientific evidence that doesn't support their beliefs but simultaneously crave the legitimacy of science but lack the competence to understand studies. Hence their abuse of a perfectly good paper as you outlined here.